A classic comfort food remade with no canned soups and a veggie twist on the traditional tater tot! A healthy take on the southern classic! A hearty and healthy breakfast casserole that is perfect for meal prepping and eating throughout the week! When a casserole is both healthy and delicious, that’s a win win in my book! This comes together in a snap, and can be prepped ahead of time and then thrown in the oven during the week! Life has been crazy this week, and I will admit that I have not gotten myself into the gym yet. But! That does not mean I give up! This fitness thing is a continuing journey and one bump in the road doesn’t mean you turn around and give up! That being said, eating healthy is one thing that I still try to stick with at least 2 out of 3 main meals of the day (plus snacks). This side dish is so delicious and is a great way to use up all those garden vegetables! I was a little skeptical when I first made this, because I’ve never really been a huge fan of zucchini or yellow squash. Once I tried it, I was instantly hooked! I’ve seen a few variations of this same recipe on other websites, but modified it to what I had in the house and was very happy with the results! 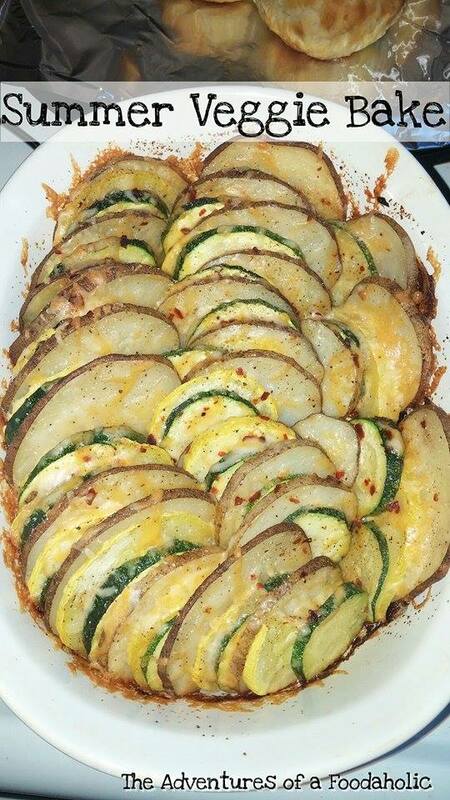 Slice potatoes, yellow squash, and zucchini into slices, about 1/4 inch thick. Alternate vegetable slices in greased 1 quart casserole dish, standing up. Drizzle olive oil over the vegetables. Top with seasoning. Bake vegetables at 425 for 30 minutes, covered. Uncover, top with cheese, bake for another 15 minutes.